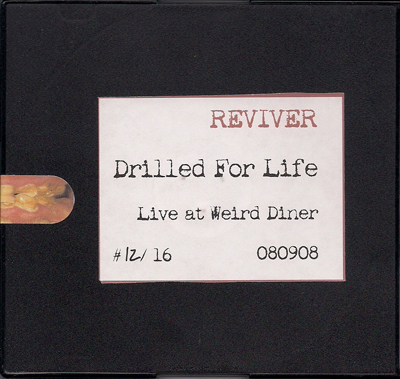 Reviver’s Drilled for Life is a short but fairly engrossing piece of distorted electronics. Approximately five minutes in length, Drilled for Life is live music set to a video of dental extraction. The unpleasant visuals are perfectly soundtracked by Reviver’s groaning, frustrated sounds. It’s like Drilled for Life is the metaphysical recording of the pain and brutality of surgery. Reviver manages to strike a balance between heavy, dirty electronics and a sort of spacey, reverb heavy sound laden with shouted vocals and rhythmic drones. The distortion is very weighty and intense but the sound deftly transitions to a psychedelic, contemplative sound with little to no abruptness. Reviver seems to take a lot of strength in alteration and quick mood change. At one time, the sound will be groaning, angry electronics than suddenly switch to bass heavy, nearly dreamy drone sections that are still dark but simultaneously lighter and meditative. Ironically, the only issue I have with this DVD is the transitions in a respect different than what I highlighted. It seems like Reviver is trying to pack in every element of their sound in a very short section, leaving me feeling like Drilled for Life is meant to be somewhat of a sampler of their work. I would rather hear them create something entirely unique, especially since Drilled for Life is accompanied by visuals (making it, in my opinion, somewhat more realized than just a short live recording). Ultimately, this DVD entices me to see what else Reviver has to offer.